Inspired by European Medieval weapons our elegant 38” LARP foam Rapier sword is safe, durable and realistic. Its light weight design and strong latex coating will allow you to thrust and slash all day long. Whether you are a nobleman or Musketeer, you can swashbuckle your way past opponents. Inspired by European Medieval weapons our elegant 38” LARP foam Rapier sword is safe, durable and realistic. The blade comes with Kevlar core tip protection and has a round fiberglass core covered by durable closed cell foam that does not shred. The handle is cast from polyurethane foam that provides enhanced detail with no maintenance! It will last longer than a latex version and is less slippery than a silicone treated alternative. Its light weight design, sturdy construction and strong latex coating will allow you to thrust and slash all day long. Whether you are a nobleman or Musketeer, you can swashbuckle your way past the competition. Our 38" Larp Foam Medieval Rapier Sword has a simulated wood grain handle and weathered steel knuckle guard. It is safe, durable, and realistic. both cosplay and battle gaming. Are you ready to pillage and plunder? a silicone treated alternative. No matter what your Queen says, SIZE does matter. 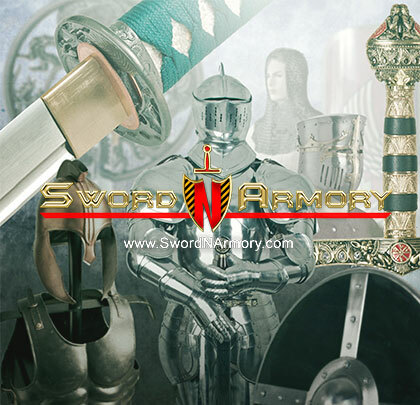 This extra large sword is realistic, durable and lightweight. Dragon slaying season is just around the corner, so don’t get caught with your hosen down. Get yours now! Ideal for both cosplay and battle gaming. the dark ages. Ideal for both cosplay and battle gaming. King Arthur Approved. Our 40" LARP Foam Ornate Medieval Double Headed Battle Axe is an executioner's dream. The 24" two-handed rustic dark wood grain handle has a girth of 4 1/2 inches and is sturdy enough for even the toughest necks. The weathered double blade has dark and light steel hues and is engraved with a triskelion spiral and eagle motif. Are you ready to lop off some heads?